Allan Quartermain: Jekyll, come on! We’ll need Hyde! Dr. Henry Jekyll: No! Hyde will never use me again. Dorian Gray: Then what good are you? Allan Quatermain: Ah, you’re missing a picture, Mr. Gray. Dorian Gray: And you don’t miss a thing, do you, Mr. Quatermain? Mina Harker: A man who worships death. Can we trust him? Allan Quatermain: He’s not the one I’m worried about. Allan Quartermain: Well, we were the faster, but now we’re the tortoise to his hare. Dr. Henry Jekyll: So, we’re done? Tom Sawyer: No, we’re alive. If M has any idea to the contrary, that gives us an edge. Captain Nemo: The sea is vast, he could be anywhere. Tom Sawyer: Yeah, well, I’m an optimist, now maybe that’s a crime to you twisted so-and-so’s but it keeps me from going crazy. Mina Harker: Your optimism’s out of place. Tom Sawyer: You’re wrong! Because we’ll get out, man… at least, I will. That other agent I told you about… was my childhood friend. We were agents together until the Fantom shot him dead. Now you can be done, but I am not. I will avenge his death. Dr. Henry Jekyll: It’s not about any one of us, Tom, it’s bigger than that. Tom Sawyer: Yes, it is, Jekyll! The fate for the world is in our hands… the world! So M tricked you, he brought you all together and you walked straight into his trap. But the way that I see it, that’s the part he did wrong… He brought you together. Dr. Henry Jekyll: He has a point. Allan Quartermain: And the boy becomes a man… perhaps a leader of men. Rodney Skinner (The Invisible Man): And they’ll provide an antidote… well, that’s if I’m a good boy. Allan Quatermain: And are you a good boy? Rodney Skinner (The Invisible Man): I guess you’ll find out, won’t you? Allan Quatermain: If you can’t do it with one bullet, don’t do it at all. Sanderson Reed: Where is your sense of patriotism? Allan Quatermain: [stands up with a drink] God save the Queen. Allan Quatermain: [to Reed] That’s about as patriotic as it gets around here. Allan Quatermain: Automatic rifles. Who in God’s name has automatic rifles? Elderly Hunter: Dashed unsporting. Probably Belgian. Allan Quatermain: No, just armor-plated. Allan Quatermain: Now, would you like to learn to shoot? Tom Sawyer: I can already. Allan Quatermain: Oh, I saw. Very American. Fire enough bullets and hope to hit the target. Rodney Skinner (The Invisible Man): I’ve been waiting all week to do that. Allan Quatermain: Get a grip, man. Rodney Skinner (The Invisible Man): Well, I thought I just did. Rodney Skinner (The Invisible Man): Well, hello to you, too. And need I remind you, I am naked in the snow. I can’t feel any of my extremities. And I mean… any of them. Sanderson Reed: There is great unrest. Countries set at each other’s throats, baying for blood. It’s a powder-keg. The trouble of which I speak could set a match to the whole thing: War. Allan Quatermain: Wi-With whom, exactly? Sanderson Reed: Everyone. A world war. Allan Quatermain: That notion makes you sweat? Sanderson Reed: Heavens, man. Doesn’t it you? Allan Quatermain: This is Africa, dear boy. Sweating is what we do. Allan Quatermain: I may have been overly rude earlier… when I called you a pirate. Captain Nemo: And I may have been overly charitable… when I said I wasn’t. But I try to live in the now… where the ghosts of old wrongs do not abide. 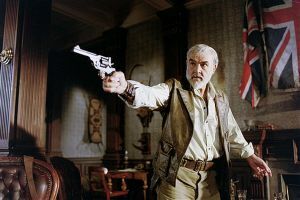 Allan Quatermain: Skinner, I want you dressed at all times, eh? Or it’s my boot up your arse. Nigel: Perhaps I should toddle off, should I, Allan? Allan Quatermain: Yes, of course, Nigel. You toddle off. Sanderson Reed: But you’re Allan Quatermain. Stories of your exploits have thrilled English boys for decades. Allan Quatermain: That I know. And Nigel has done a grand job reminding me. But… with each past exploit I’ve lost friends, white men and black… and much more. And I’m not the man I once was. Allan Quatermain: May this new century be yours, son, as the old one was mine. Rodney Skinner (The Invisible Man): So, how did M get you? Allan Quatermain: None of your business. Mina Harker: You’re a little testy, Mr. Q.
Allan Quatermain: Mrs. Harker, I doubt if you measure danger the way I do. Mina Harker: And I imagine you with quite the library, Mr. Quatermain. All those books you must have read merely by looking at their covers. Allan Quatermain: I’ve had women along on past exploits, and found them to be, at best, a distraction. Mina Harker: Do I distract you? Allan Quatermain: My dear girl, I’ve buried two wives and many lovers… and I’m in no mood for more of either. Rodney Skinner (The Invisible Man): You can send ‘em my way. Allan Quatermain: Skinner, shut up. M: I hope I’ve got your fire when I’m your age. Allan Quatermain: You will not live beyond today. That I promise you. Sanderson Reed: The Empire needs you. Allan Quatermain: But the question is, do I need the Empire? Allan Quatermain: Very operatic. And what’s in it for him? Allan Quatermain: [sniffs air] He’s afraid. Tom Sawyer: [sniffs air] I don’t smell anything. Allan Quatermain: I don’t like theatrics. M: I am known by many names, Mr. Quatermain. My underlings call me Sir. My superiors call me M.
M: To the death. But you’ll need Hyde to make it mine. Allan Quatermain: He’ll be making his own fight. Allan Quatermain: Heh. That was naughty. Allan Quatermain: Eyes open, boy. I can’t protect you all the time. Rodney Skinner (the Invisible Man): Hello, Dorian. The great white hunter’s bagged his prize. Dorian Gray: Or the prize bagged him. Allan Quatermain: Stay back, if you value your lives. Allan Quatermain: [being lead down a staircase that doesn’t seem to end] Where are we going? Australia? Allan Quartermain: [after the exploration pod has been stolen] We can track it. Captain Nemo: Track it? I intend to catch it! Allan Quartermain: Adjust for wind and target movement. Tom Sawyer: That’s easy, too. Allan Quartermain: Here’s the part that’s not. You have to feel the shot. Take your time with it. You have all the time you need. All the time in the world. Sanderson Reed: But he’s so far away. Sanderson Reed: Yes, I thought he was. Allan Quartermain: God, I hate getting old. Allan Quartermain: The Phantom is M. And the hunt is still on. Dr. Henry Jekyll: What are you talking about? Allan Quartermain: The Phantom is M. The same man who recruited us. Dr. Henry Jekyll: [trying to examine Allan’s wound] Let me see that. Allan Quartermain: We’ll get our answers. Where are the others? Mina Harker: [entering] Dorian’s missing in action. And Mr. Skinner must have fled when he realized we knew. Tom Sawyer: [entering with a bloody lip] He’ll live to fight another day. Mina Harker: [advances towards Tom, he draws back] Don’t worry, I’ve had my fill of throats for this evening. Please share other Connery quotes or any other thoughts/memories you have about the film in the comments below. Thank you for your interest in Sean Connery and The League of Extraordinary Gentlemen.